Holy Smokes Batman! The KidsEmbrace Batman Baby Activity Walker is ready for adventure and fun anytime! Your child will love learning to walk and explore when they are strapped into the ultra-comfortable and super-sleek security harness, which is made of polyester foam and covered with polyester batting for added support and durability. Batman knows that security detail is top priority, which is why the Batman Baby Activity Walker is proven to meet or exceed the American Society of Testing Materials Certification (ASTM F977-12). As a parent, you need not fret in of spills or accidents as the cover can be quickly removed and is machine washable, while the remainder can be quickly wiped clean. Designed to grow with your little hero, the Batman Baby Activity Walker features three height positions that lock into place and a high backrest for added support and comfort as they continue to get bigger. Even better, your Batman fan will never want to leave their version of the Batmobile with all the fun they will be having in it! The Activity Tray features a start key which will make the engine run and lights turn on and a shifter which includes multiple sounds and vibrates. To top it off, hold down any of the light-up buttons to make them glow and make additional noises! Lastly, when your superhero does finally retire to their Batcave, you can quickly remove the security precautions and collapse the Baby Activity Walker for easy and compact storage. 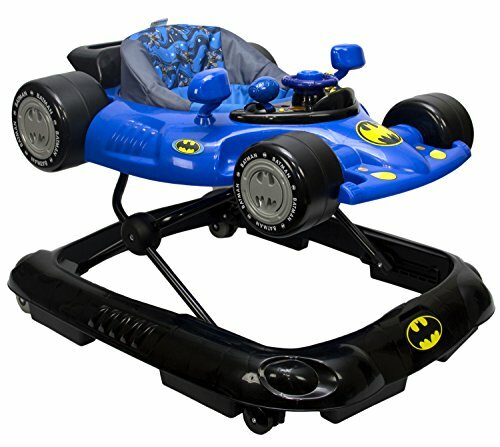 Safe, fun, comfortable and Batman-approved, the Batman Baby Activity Walker is the ultimate Activity Walker for all kids! ENTERTAINING: Start your engines! The activity walker comes with an easy-swivel steering wheel, gear shifter and attached key, which all make sounds, vibrate and flash lights when played with! EASY CLEAN: Don't fret! The polyester cover can be removed and cleaned in your washing machine. The plastic is quick to sanitize as well. COMFORT: The harness is designed for ultimate mobility and comfort. Made of 100% Polyester Foam and covered in a machine-washable 100% Polyester Batting, your youngster can enjoy their breathable, lightweight and secure harness. SPACE SAVER: The Activity Walker can be collapsed and folded for easy storage. Simply unhook the child-proof security latch to quickly make more space. AGE AND SIZE RECOMMENDATIONS: The Baby Activity Walker is meant for children between 6 months and 18 months old and weighing up to 26lbs. If you have any questions about this product by KidsEmbrace, contact us by completing and submitting the form below. If you are looking for a specif part number, please include it with your message.